Between this year’s Canada Reads books and Don Winslow’s The Border, I spent the majority of the first quarter of 2019 reading some really heavy stuff. So when I put down Lindsay Wong’s The Woo Woo last week, I perused my bookshelves for something fun and light. 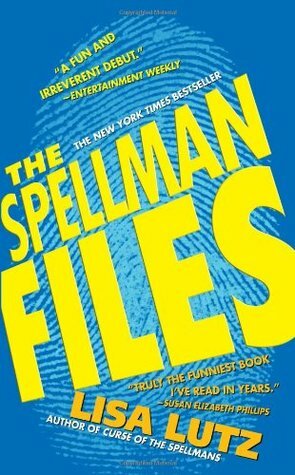 I settled on Lisa Lutz’ The Spellman Files, a book I picked up at a used book sale about a year ago. After checking out some reviews on Goodreads promising an enjoyable read, I sat down to dig in. After finishing The Spellman Files today, I cannot think of a more perfect book for what I needed at this very moment. Cinematic tangent aside, this is a well-written novel with prose that lets your eyeballs slide along the page like cooking oil on a teflon pan. This is pure, digestible fiction that lends itself to long reading sessions where you completely lose track of time. It isn’t heavy and the mystery is well-constructed leaving me guessing up until the end. My only complaint involved Isabel’s relationship with her dentist boyfriend Daniel (also named ex-boyfriend #9). I just flat out didn’t buy it. I didn’t feel there was enough chemistry between the two that warranted Isabel’s aggressive romantic pursuit. That being said, I didn’t find it offensive and it didn’t detract a huge amount from the overall story (it’s not like Isabel spends pages and pages pining over him) as Lutz’s storytelling style moves quickly without lingering on any one aspect of the plot for too long. Bottom line is that their relationship just didn’t feel authentic to me. I’ve used this phrase before, but Lisa Lutz’ The Spellman Files is pure literary comfort food. Even the best of books can feel like a slog sometimes if they’re overly long, but at 442 pages, not once did this feel like it extended its welcome.